Our sapphire heart earrings are fit for a princess. 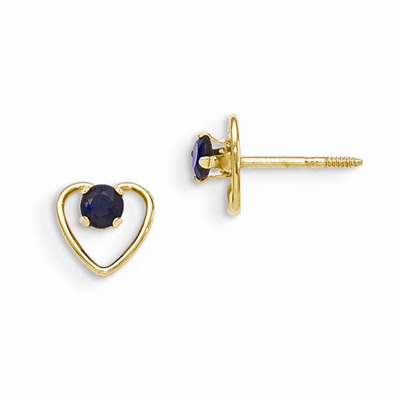 Our sapphire heart earrings make the perfect birthstone birthday gift and are set in 14 carat yellow genuine gold. The brilliant blue sapphire sparkles in this pair of earrings with a polished finish. Measures 6mm in length and 6mm in width. We guarantee our 3mm Sapphire Birthstone Heart Earrings, 14K Gold to be high quality, authentic jewelry, as described above.